Biotin for hair, skin and nails support. Bioflavonoids and antioxidants for immune support and to protect cells from damage due to free radicals. 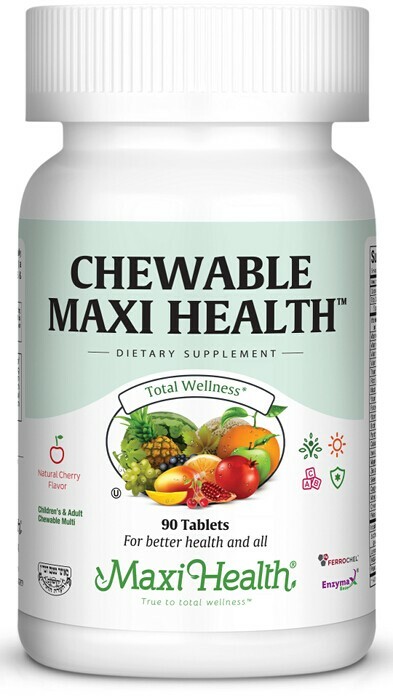 You don't have to be a kid to like Chewable Maxi Health®! Try it - You'll see! Chew up to 3 tablets daily depending on age. Ages 2-4: one (1) a day; ages 4-8: two (2) a day; ages 8 & up: three (3) a day or as directed. Other Ingredients: Sucrose, fructose, maltodextrin, stearic acid, magnesium stearate, silicon dioxide, natural flavors, Stevia rebaudiana extract, and Enzymax® (calcium carbonate, bromelain, papain, lipase, amylase, protease, silica). This product contains NO wheat, soy, salt, milk, yeast, gluten, artificial flavors, or colorings. CaroCare® is a registered trademark of DSM.